Who else likes the show The Nanny with Fran Drescher??? I just love her and this show and we've been watching it on Netflix recently. 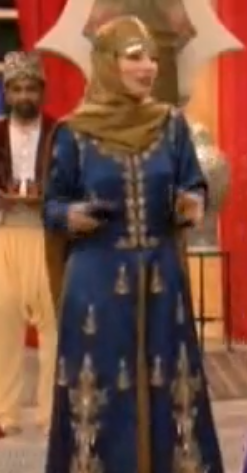 She went to a fictional Muslim country in an episode called "Not Without my Nanny" and this was one of her outfits (this was the only one fully hijab appropriate). I LOVE this! I'd wear this if it wasn't weird to. I like the dangly things on the forehead, the chest-covering but dress-showing hijab draping in the back and the jilbab is gorgeous. She totally cracks me up and I totally agree that it's kind of amazing! The show was amazing and brought me many laughs throughout high school!